Hardwood flooring is a popular product with modern consumers, and for good reason. It’s clean, durable, and attractive. While the floor’s appearance is partly determined by the type of wood you choose, the way the wood is cut is also an important factor. Not only does it have a bearing on the appearance of the product, but it also affects how the wood behaves after cutting. When you’re considering wood products for your floors, you’ll likely hear the terms “hardwoods” and “softwoods” being used. Both Hardwoods and Softwoods have distinctive looks and one over the other may suit your décor better. Hardwoods are deciduous trees that have leaves, which they generally lose in the fall when they go dormant. This type of tree produces either fruits or nuts. Most species of hardwoods can be used for manufacturing floors, cabinetry and furniture. Each type of wood has its own grain patterns, some are open grain wood such as Oak, Ash, Chestnut, Hickory or Elm. Others are open closed grain such as Cherry, Maple, Birch and Walnut. Choose either open or closed grain there will be color, texture and markings, which give you plenty of variety when making a decision about flooring for your home or office. 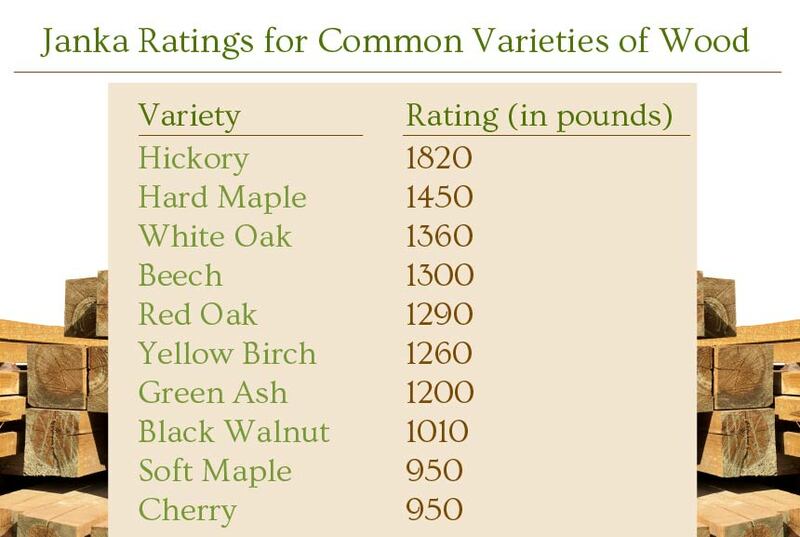 The Janka Ratings System ranks the relative hardness of different types of wood. When you’re considering specific types of wood for flooring, keep in mind that softer woods will show wear and tear more quickly than harder varieties of wood. If you’re looking for a type of wood for a high-traffic area in your home or office, you would be better off with a variety with a higher rating. The higher the number, the harder the wood and the less likely it’s to show wear and tear from regular use if smooth. Even though all hardwood floors are made from real wood, the properties of each type vary in ways other than the trees’ hardness. The region where the trees grew, the method used to saw the log for flooring and the manner in which it’s dried combine to create a unique floor. Artisans prize trees harvested from northern forests for their consistent color and tighter growth rings due to the slower growing season. They also produce a more desirable end product. The type of flooring cut made into the wood at the sawmill makes a difference in the appearance and quality of the flooring. This is the most common type of flooring cut used today. Also known as flat sawn, it involves workers cutting a side of the log and then turning it 90 degrees before the next cut is made. The process continues in the same fashion until they use the entire log. Even though it’s an efficient method of cutting wood, it produces more waste material than live sawn milling. Graining in plain sawn wood is between 0-30 degrees. As a result, you’ll see large, open patterns on the boards. These are referred to as a “cathedral effect,” since they resemble the steeples of these large places of worship. Many houses built in the early-to-mid 1900s had both quarter sawn and plain sawn red and white oak floors. The floorboards measured 1-1/2”, 2-1/4” and 3 inches across and for a number of people, this is what “traditional” oak flooring looks like. The first step in rift sawing wood is to cut it into quarters. Next, the wood is cut radially perpendicular to its growth rings. This type of cut produces grains at angles of 30-60 degrees, with 45 degrees being the most desirable. It’s the most expensive way to saw wood, and likely for this reason, it’s used the least often. The result of the cuts is a straight grain pattern with discernible flecking. This type of cut has the potential to produce flooring boards of exquisite beauty and extreme stability with a linear appearance that you don’t get with other types of cuts. If you have your heart set on having hardwood in your home with a long, straight grain pattern, you’ll want to look for boards that have been rift sawn. With this type of cut, it’s very difficult to get floorboards wider than four inches and greater across. This type of cut in softwood flooring would be called Vertical Grain. When a log is being cut for quartered flooring, as the name implies, the first step is the cut it into quarters. Next, it’s cut perpendicular to the growth rings in the log. It produces tight graining at angles of 60-90 degrees, resulting in that are close to the surface of the boards. The resulting pattern is beautiful flecks of color from the wood’s medullary rays (ribbons that extend vertically through the tree, perpendicular to the growth rings). Quarter sawn milling is more expensive than plain sawn, and this method produces more waste material. Boards sawn using this method are generally narrower than ones cut using the plain sawn method. Red and white oak is generally quarter sawn in order to show off the wood’s distinctive straight, striped grain. This method of sawing wood for flooring matches the wood grain of Mission-style furniture. If you want to create a coordinated look with your flooring and furniture, you’ll want to keep this detail in mind. With this method, the log is cut straight through with each pass. Subsequent cuts are parallel to the first one. The yield is a mix of plain, rift and quarter sawn woods; there will be about one-third of each per log. Since all the cuts are straight, this method is virtually waste-free. This method also produces the popular wider boards popular with consumers. Wood is a material that expands and contracts with changes in moisture in the surroundings. This property means boards cut for flooring will swell and shrink in certain ways depending on the specific method used. Due to the direction of the growth rings, plain sawn boards change in dimension in width. The wider the board is to begin with, the greater the potential for change. Rift sawn and quarter sawn boards will expand and contract in thickness due to changes in moisture. Drying the lumber used for a hardwood floor is one of the most important aspects to how the finished product looks in a home. On the surface, this appears to be a very mundane task. It’s impossible to tell from looking at a board whether it was dried using the proper methods or not. However, if you want to have a stable and high-quality wood floor, it’s imperative to start with materials that were dried properly. Before you can understand the procedures involved in drying wood, it’s important for you to understand the way a tree grows. Their medullary rays act in the same way as the veins in your body — they transport nutrients through the trunk to the parts of the tree where they are needed while the tree is in the ground. When a log is cut into lumber, the medullary rays are clearly visible. In species of trees like white oak, they are especially pronounced. The medullary rays run perpendicular to the annual growth rings that the trees create each year. When a tree is standing, it creates a growth ring around the trunk, running parallel to the ground — the medullary rays run vertically from roots to leaves. After cutting, the lumber releases moisture through the medullary rays. For this reason, plain sawn and quarter sawn wood does not dry in the same manner. In a plain piece of wood, the medullary rays run perpendicular to the surface, which means that moisture has to move out of the board through the thickest part. In a 4/4-inch piece of lumber, moisture from the center has to move approximately one-half inch from the middle to make it out of the board. The lumber will dry more quickly than a quarter sawn piece of lumber, since moisture in a 4/4 by 6-inch quarter sawn board would have to move three inches from the center in order to escape. Since the moisture would have to move further in order to evaporate, it would take longer to dry. There are two general types of kilns, compartment or progressive. Compartment kilns can be loaded with lumber all at once. The entire load of lumber remains stationary during the drying process. The operator can adjust temperature and humidity as the wood dries. A progressive kiln can accommodate a load consisting of wood at various stages of drying at the same time. Two thermometers are used to monitor the drying conditions along the length of the kiln. The exact time it takes to dry a particular type of lumber varies, depending on thickness, the initial moisture content and the nature of the wood. The type of kiln also has a bearing on the time it takes to dry a load of lumber, as well. What is Reclaimed Solid Hardwood Flooring? Reclaimed solid hardwood flooring uses wood that was collected from barns and other agricultural outbuildings. This wood could be anywhere from 75 to 200 years old. Since the original builders of the buildings tended to use locally available trees for building purposes, more than likely the lumber is from forests that existed prior to the area being settled. The grain of the wood was tighter than what is available today due to slower growth experienced. When you’re choosing a reclaimed wood flooring company, you’ll want to be sure to do your due diligence. You need to ensure that you’re dealing with a company that is reputable and staffed with employees who have been in the business long enough that they know how to select the right wood for the project you have in mind. Inquire about the source of the lumber used to make the flooring to ensure it’s from barns and other farm buildings originally built from old growth trees and to ensure that new or “pallet” wood isn’t being mixed in. Old growth trees are more desirable, since they are stronger and more resistant to rot. Due to their low moisture content, old growth trees are less likely to be home to insects who would otherwise feed on the wood. Be sure to ask for photos of the flooring company’s previous work, as well as samples of different types of reclaimed wood flooring that are available. The sales representative should be knowledgeable about the products and able to answer your questions, or willing to find out answers for you. Look at multiple samples to determine whether the flooring has tongue and groove and does the tongue and groove fit together on a flat surface. Ask the manufacturer whether the company provides details to its customers about manufacturing and shipping as a general policy. Always ask what is your waste factor when ordering a reclaimed floor. Inquire about precautions that they’ll take to protect the flooring while in transit to your location. There are still places around the world where you can find old growth lumber, but it would be a very expensive proposition to access it. In North America, eager manufactures mostly depleted the supply of old growth lumber by the middle of the last century. The American Chestnut, along with some other species, were very nearly wiped out. Reclaimed wood is an environmentally friendly source of flooring materials, since you’re reusing existing resources to beautify your home instead of consuming more products. In return, you’re getting a highly functional, beautiful hardwood floor with the potential to last for many decades. As mentioned, the wood used to fashion barns and other agricultural buildings is superior to what is available for harvest today. All you need to do now is select the specific type of flooring milled from old growth lumber that appeals to you most. We invite you to view our Heirloom Series of wide plank flooring. Available in lengths ranging from 2-12 feet, there are a number of tones to suit any taste and decorating plan. Contact us today to discover more about our hardwood flooring and other products.